Delayed for so long that I’d almost forgotten I’d ordered them, the retro-style ‘Alien’ action figures from Super7 finally arrived on my doorstep just in time for Christmas. [T]hese action figures are based on a canceled toy line that the Kenner company (now part of Hasbro) originally planned to release in 1979, hoping for the same sort of merchandising bonanza that ‘Star Wars’ had previously delivered. Those plans were scrapped at the last minute when someone finally pointed out that ‘Alien’ was an R-rated horror movie and not kid-friendly at all. For many years, collectors coveted photographs of prototypes they assumed they could never actually own… until Super7 landed a deal to license the original molds and produce the line exactly as it almost came into being. 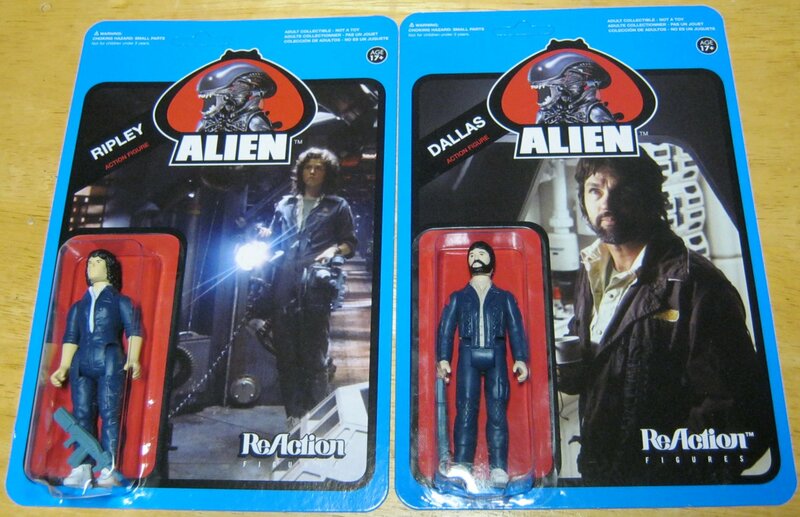 Pre-orders for the “ReAction” figures opened on August 1st this year, at a price of $100 for the full set of five, which includes Ripley, Dallas, Kane, Ash and the alien itself, all in appropriate vintage-style packaging. Initially, orders were only opened for a one-week period before selling out. However, Super7 later announced that it had struck a new partnership with another toy company called Funko to expand distribution. Funko now plans to sell the figures individually at a price of $14.95 each. We are aware of the discrepancy in price with the new agreement, so there is a additional, secret figure that will be included in the Super7 pre-orders that will be available only for those who pre-ordered sets of Alien from us, and will not be available anywhere else. (And preorders are long since closed.) We think it will be a nice thank you to everyone who believed in this project and pre-ordered ahead of time, being part of the excitement of the release of this long-awaited line of figures. Now that the pre-order package is finally here, just what exactly is this additional mystery figure? 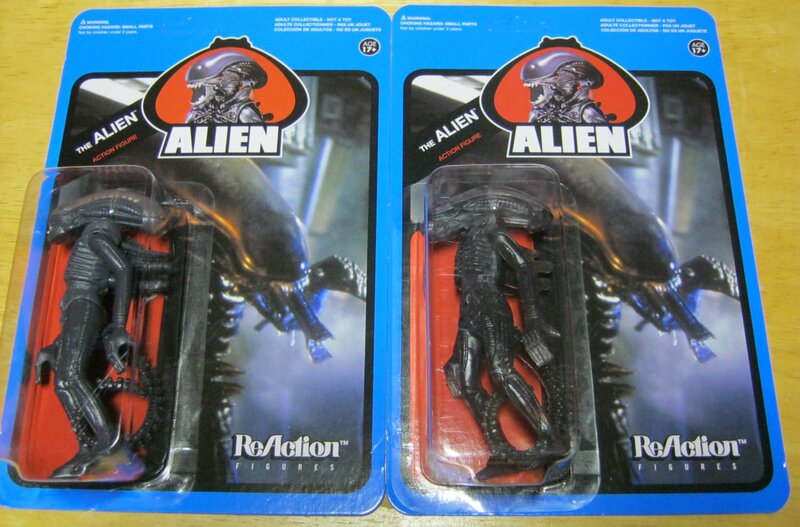 Well, it’s a second copy of the alien in a variant “smoky gray” color scheme that, quite frankly, doesn’t look all that different from the regular alien figure, except that the plastic is somewhat translucent. I’m not going to lie to you; I’m a little disappointed in that aspect. Here are photos of all six figures in their cardboard blister packs. If you click to enlarge, you can see the small difference between the two aliens. I’m not generally the type of collector who leaves action figures carded. However, in this case, I feel that the retro packaging is a big part of the appeal. They look nice on display in my home theater room. Even though the variant mystery figure is a letdown and not really worth the $25 price difference, I’m satisfied with this purchase overall and don’t regret pre-ordering. These are fun collectibles that I’m glad to own. Pleased with the initial success of these ‘Alien’ figures, Super7 and Funko plan to expand the ReAction concept to additional licensed properties, potentially including ‘Buffy the Vampire Slayer’, ‘Firefly’, ‘Predator’, ‘The Goonies’, ‘The Terminator’, ‘Escape from New York’, and ‘Bill & Ted’s Excellent Adventure’. I believe the intention is to make these in a similar vintage 3 ¾” style – the difference being that they’ll have to be original sculpting designs. Whether all of these will actually come to fruition or not, I can’t say. I’m not sure that I’d want to collect them all, but I’ll be interested to see what they look like. “The Goonies”, oh please … please do it! It such a shame that Mezco never produced a second wave. I’m still surprised I passed up the preorder on these figures, I may do so for a Bill & Ted set. 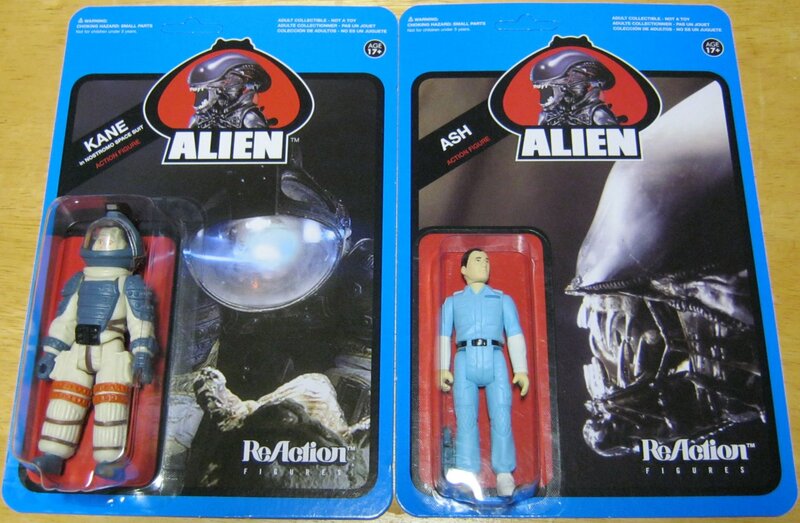 In this particular Alien case, I think they only produced the figures that were originally planned in 1979. As in: the used the actual molds, they didn’t create anything new. That’s why some crew members are missing. 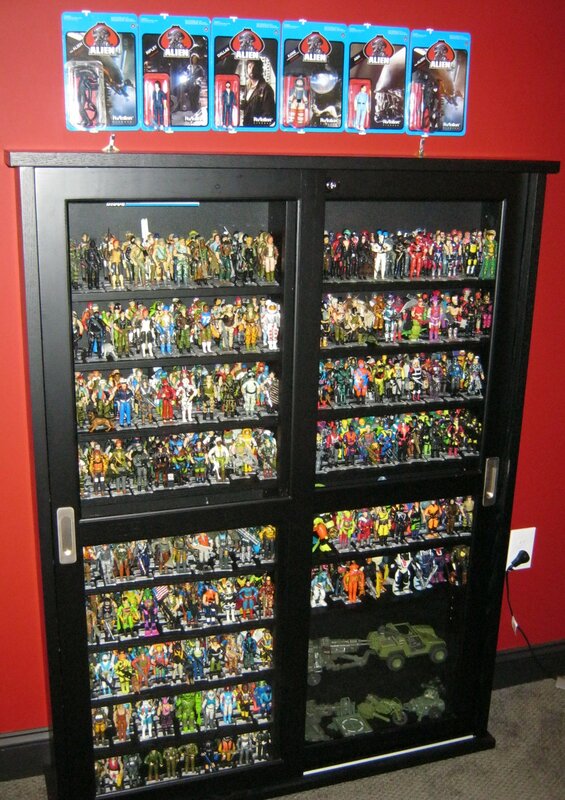 Are those all of your gi joe figures or do you keep some in a different place? I was waiting for someone to comment on that last photo. That’s the complete original run of G.I. Joe figures from 1982 to the line’s first cancellation in 1994. (Those shelves are each packed 3-4 rows deep.) The line was revived a few years later (and is still running today), but I don’t like the later figures nearly as much. I stopped collecting in the early 2000s and don’t feel the need to display anything after the original run. I have a large selection of those, but they’re boxed up in a closet right now. I don’t see the Sgt. Slaughter in his standard camo gear. I believe you had to buy him with the vehicle just like you had to buy Serpentor with his air chariot. You seem to only have his mail-in version that represents the drill instructor outfit, which was never reflected in the cartoons. They’re both in there, as well as the Slaughter’s Marauders version with the blue shirt. Not everything is visible in the photo due to the angle. There are at least two rows on the left hidden behind the frame of the door. I thought that may be the case (the frame blocking the view). Interesting that we both have Croc Master displayed down on one knee given the short length of the alligator leash. Fyi, I also have the full collection thru 1994 loose and on display along with the complete anniversary release from several years ago although those are carded (not loose). My solution was placing the figures in a large all plexi-glass case. It’s pretty deep allowing enough room for the figure-specific vehicles to be displayed such as Zartan on his Swamp Skier, Slaughter in his Triple T, Serpentor on his Air Chariot, etc. I’m pretty happy with it although I wish there were an efficient way to display the file cards individually (I have them all in alphabetical order in 2 small plastic open top boxes made to look like a file cabinet-one for the good guys & one for the bad guys-sitting on top of the display case). When I grow up I’d like to devote a full room to the collection with all vehicles and figures posed in different battle scenes (like the pictures they had in the old fold-outs that came with the vehicles) so I could display the larger set-pieces like the Joe HQ, Cobra Terror Drome & FLAGG properly. Maybe even hanging the flying vehicles from the ceiling with some heavy clear fishing line….until then they sit boxed in garage cabinets. Anyway, sorry about going on the tangent, that was the Joe fanatic in me…and congrats on a nice collection. Aside from the 1982 vehicles on display (and I seem to have lost my MOBAT, dammit), I sold off most of my vehicle collection several years back. Didn’t have any room to store or display them at the time, and frankly still don’t. I always cared more about the figures than the vehicles anyway. I’ll be honest that there are some minor figure variations that I haven’t bothered to collect. I can’t bring myself to care about a Blowtorch with slightly darker colored eyes and eyebrows than another, or The Fridge with a brown belt rather than a silver belt, for example. I also don’t have every version of Starduster or Steel Brigade, just the major variations (including gold head). I’d still like to flesh out my collection with more vintage foreign figures.